Well, here it is, the supposedly final issue of The Flash. So how does it read? And how does Geoff Johns & Francis Manapul’s brief 12-issue run hold together? This one’s better than the previous issue, with a super-speed battle, revelations about Professor Zoom, the Speed Force, Flashpoint and Kid Flash, and even the background between Barry Allen and Patty Spivot. Scott Kolins’ art looks better as well — whether he had more time, or whether the super-heroics is just better suited for his current style, I couldn’t say — and Francis Manapul’s cover (revealed just yesterday) is great. Still, the whole “Road to Flashpoint” arc feels like something’s missing. The biggest problem, I think, is that everything from Flash: Rebirth to this point was supposed to be a steady build toward Flashpoint, but the combination of slowly-paced long storylines and publishing delays meant that instead of progressing from A to B to C to D to E to Flashpoint, we instead spent a lot of time on A and then a lot of time on E without actually following the steps to get there. I can’t believe I’m saying this, but I think maybe making a clean break at this point and starting fresh after Flashpoint is exactly what the book needs. I mentioned that I liked Kolins’ art better in this issue than last. One sequence that stood out was the way he portrayed Zoom and the negative speed force. It looked more like flowing energy streams within Zoom’s body than the usual lightning leaking around it, which was a nice change, and a good way of showing that Thawne was using the powers differently. Still, I miss the background details that Francis Manapul works into his art, like the fire extinguisher behind someone who’s still carrying a flame. Further discussion will require SPOILERS! So: Thawne’s nonsensical plan stands revealed: He was just trying out his powers. Um…OK. He also provides an interesting interpretation of the speed force: that it effectively is time. This takes me back to an essay I read during the late 1990s suggesting that the Flash’s powers weren’t really super-speed, but slowing down time…essentially what Hunter Zolomon’s powers were later described as in “Blitz.” Of course, those powers were described as being distinct from the Speed Force. The Flashes may need to revisit that theory. I’m glad that they didn’t go to the effort to drag Patty Spivot back from limbo only to kill her. That would have been a waste. I find it interesting that in the new history, she was actually a scientist at the Central City crime lab before Barry Allen, while originally she started shortly before Iris’ death. Setting it up so that she wanted a relationship with Barry way back when, and still holds a torch even though she knows it can’t go anywhere, sets up an interesting dynamic without tarnishing Barry and Iris’ past…though as a long-time reader, I have to wonder: why graft this story onto Patty, when there are other women (Daphne Dean, Barry’s childhood sweetheart, or more importantly Fiona Webb, whom Barry almost married) who already have this sort of history with him? The main problem is with the emotional drama at the core of the story: Barry isn’t paying attention to his family. At least, that’s what we’re told, since they haven’t really had a chance to show it. I know I described the intervention last issue as “payoff” for the little things that have been wrong about Barry since his return, but the more I think of it, those have only been in “Rebirth” and “The Road to Flashpoint.” There was no time in Blackest Night, and “Dastardly Death of the Rogues” led us to believe he’d worked through all the drama. This is where more, tighter stories would have worked better. We could have seen Barry repeatedly blow off family obligations until it built to the point that the intervention made sense, rather than having to take it on Bart’s and Iris’ word that it’s a problem. When Barry Allen first appeared in the Silver Age, twelve issues would have given us 24 stories about the Flash…not two and a couple of stories about his enemies. I’m not saying we should go that far, but imagine if we’d had four three-issue stories between Blackest Night and Flashpoint. That would have gone a lot further to really establish Barry Allen as the Flash, tell some stories, and build up to the big event. As it is, it feels like the series has simply been running in place until Flashpoint was ready to start. 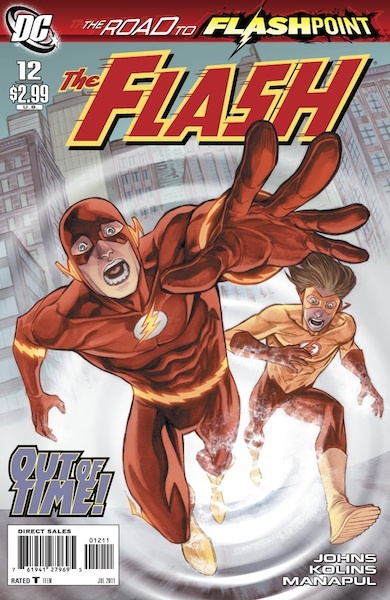 This entry was posted in Reviews and tagged Barry Allen, Bart Allen, Flashpoint, Francis Manapul, Hot Pursuit, Professor Zoom, Road to Flashpoint, Scott Kolins on May 12, 2011 by Kelson. As usual, I agree with you whoeheartedly. This relaunch has been a big disappointment. While it hasn’t been horrible, I haven’t read a single issue that blew me away. Remember the buzz you got seeing Barry Allen appear in Wonderland?? The shock you felt reading the first issue of Blood Will Run? Weather Wizard’s son? The Thinker’s attempt at taking over Keystone? Remember when Hunter finally first became Zoom? Jeez, even Rogue War was a blast with Hunter and Eobard teaming up? All those great moments came from the same writer who has given us 12 lukewarm issues of the Flash, while also managing to virtually ignore the character who starred in all the great storylines mentioned. So I guess my question is, why did it go so wrong?? It didn’t. The Flash is still one of DC’s top-selling comics, and been pretty well-received too. Just not by 100% of fans. Some had legitmate critiques (such as the excellent review we’re commenting on), but the truth is that a lot of the angst aimed at this book stems from the angry Wally contingent who were set to dislike it anyway. Myself, I agree with the above review. In summary, I felt this last arc was hastily-put together and forgettable. It seemed like the wheels came off further with each issue. But the Dastardly Death of the Rogues is the best Flash story I’ve read since Blitz. A shame the same creative team couldn’t keep that level of quality going. 1. Weak characterization. We still have no answer to the question: “Who is Barry Allen?” Iris Allen appears to have no personality, and the rest of the Flash family? Barely there. 3. Johns and Didio mentioned a lot of cool things would happen in the book during the run-up to Flashpoint. For example, fans of the previous flashes would like what they read, said Didio. Johns, meanwhile, said at a con last year that the series would introduce a new villain and a new supporting character. Thus far, the series has reintroduced seasoned Flash villains (Captain Boomerang, Professor Zoom), and the only newly added supporting character is Patty Spivot, who was first introduced in the late 1970s. Johns also said readers would see more of the Flash family. We’ve seen them in a few panels at a family picnic. And at the intervention. 4. Disrespect for fans of Wally West. That, IMO, was what irked fans, not the simple absence of Wally. Didio was asked about Wally and replied, “Which one’s Wally?” A couple of covers featured Wally in costume, but he either a. wasn’t in the book itself or b. was featured out of costume at the infamous intervention. Whether DC wants to admit this or not, Wally is the Flash to a generation of fans. Dropping him from the book was a mistake. They could’ve kept him in costume to give advice or updates to Barry, while still leaving Barry as the main Flash. They would’ve probably kept on some readers that way. 5. Frequent delays. The Flash might as well have been a bimonthly book. At one point, DC published two Flash stories within two weeks of each other. Both were villain profiles (of Capt. Boomerang and Prof. Zoom) followed by a new issue of the Flash two months later! This is not the way to sustain interest in Barry Allen or reintroduce him to new readers. 6. Putting the cart before the horse. I’m aware that DC wants to turn the Flash into a big franchise, a la Green Lantern. In this case, they did it by hauling Barry out of the Speed Force and then rushing him into a new event right after two others had just wrapped up. With Green Lantern, Johns focused on good stories and good characters to expand the GL mythos and add new elements. I don’t get it. Why didn’t he do the same here? 1. Disagree; I think Johns/Manapul did a great job of setting up Barry’s identity, world and cast, in that 1st arc (TDDOTR). Characterization, great displays of Flashes powers, themes such as the sped-up, overdrive world we live in, and solid in-general world-building – Central City, Barry’s job, etc. As someone who didn’t like Rebirth much at all, it was a really well-done starting point. 2. Disagreed on TDDOTR; thought it was the best Flash arc since Blitz. I thought Road to Flashpoint was forgettable; a C- grade from me. 4. I disagree with this whole notion of disrespect. DC doesn’t OWE you/us anything regarding Wally, Barry or whoever. They can simply not publish stories with him. And that ain’t disrespectful. They have revealed they’re planning stuff with all the Flash characters. And when they’re ready – not when we’re ready, mind you, but when THEY’RE ready to publish – we have the option to buy them. That’s the relationship here. So asking the same questions over and over – especially the ones that might spoil storylines or character deaths? Eventually they’re gonna make jokes. 6. I suspect because of #5. Rebirth ended late. The ongoing got started late. The last arc was really late. If all those ran on time, we’d have gotten 2 more story arcs prior to Flashpoint. Which likely explains why RTF was so disjointed. Nobody’s arguing that it’s up to DC to decide what characters to use. The point is that there seems to be a tendency to say one thing and then do another. There were supposed to be backup stories featuring Wally. So far, no backup stories. There was supposed to be a spinoff Speedforce book. No word on that in a long time. The book was supposed to feature the Flash family as Barry’s support cast. They’ve barely appeared. Fan questions about favorite characters are a given at conventions. As long as the fans are respectful and not hostile, it behooves the creators to be gracious in their replies without giving away spoilers. Well said Realitätsprüfung, their is a clear disconnect between fans on the entire Flash relaunch but that’s to be expected. I’ve personally loved DOTDR and enjoyed TRTFP but in the end the delays killed almost all the buzz and momentum of the book. It’s sad that because of whatever reason from Flash Rebirth until now we haven’t been able to get an artist on the book to get it out monthly and that’s why the relaunch didn’t go off as well as it could. But I will agreee with one point you made Kelson now is the perfect time for a break with Flashpoint starting up. Now they will have time to get the entire Flash family up and running and learn from their mistakes of the relaunch. In the end we’re never going to agree on part of Johns relaunch but part 2 is where things will really tell the story of how things go. And I actually have hope again that everything will be well Kubert is ahead of time on Flashpoint and Johns is great at longterm planning and fixing problems so i’m excited for Flash again. Good write up Kelson. While I’ve enjoyed the relaunch I have two complaints about it. 1. It has been way too padded. The first story arc was at least one whole issue too long. 2. Barry has kinda been a tool. I think part of that is all the agnst his mommy issues are causing. Hopefully after Flashpoint they are gone. okay, I guess that is a third thing I didn’t like. Good point. The relaunch of the Barry Allen Flash, while welcome to an old Barry fan like me, has been a disappointment primarily due to the pacing issues you nailed. This is a very clear case of how the modern “paced for the trades” policy can negatively impact a character, especially one that’s essentially being introduced to fans (and a super-speed character at that)! It seems character revelation and development have taken a back seat to the mechanism of selling trade paperbacks while at the same time reacting to or setting up for the next mega-event. The DCU has become such a large, interconnected entity that there seems to be no sense of an individual character’s world and cast of characters, and the first dozen issues of Flash were clearly missing that element. As we’ve seen with the (generally) excellent solo issues featuring the Rogues, Geoff Johns is capable of telling great “done in one” stories…but it’s a pity that same skill can’t be lavished on individual good guys in the Flash Family. As you said in the review, hopefully the post-Flashpoint series will feature those kinds of stories. I know Johns likes to do villain profiles, but did we really need two back-to-back villain stories in one year? Professor Zoom I could see, but Captain Boomerang? IMO, that could’ve been postponed and maybe there could’ve been a cool “done in one” story. I think the reason why they used Patty instead of Daphne and Fiona goes back to something else you said about Barry. It tarnishes him. Barry was attracted to both Daphne and Fiona, which means he had feelings for women other than Iris. With Patty, they can play up that it was unrequited, and thus preserve Iris as the only love of his life. I think they used Patty because it keeps the story focused on his job. If he were to meet with Daphne or Fiona then they’d have additional subplot and environments required outside of Barry’s workplace. So the intent was more a matter of efficiency. I agree with your assessment on the “positioning” and usefulness of the character but I think it isn’t beyond Geoff Johns to use anyone else from the past at any time either. I am a huge Wally West as The Flash and Bart Allen as Kid Flash fan. They are my favorite characters in all of comics. I LOVED Rebirth, ate up everything Johns-penned in Blackest Night (Barry was the co-star you know and Wally/Bart definitely have a presence later on in the main miniseries), and really enjoyed TDDotR apart from the delays. I thought issues 7 and 8 were amazing, with 8 being my favorite issue Johns has written ever. The Road to Flashpoint though? It’s just been slow…and I’m not referring to delays (issues 10-12 each came out 2 weeks apart!!!). The storyline itself has been slow. The only redeeming factor was when Thawne revealed himself and had a major presence in issues 11-12. I have been a huge Flash fan since I was 1996-1997, somewhere in there. I was 6-7. So basically we’re talking my whole life so far. I grew up reading Hyperborea.org. I love these characters. The heroes, the Rogues, the other villains, the extensive supporting cast. But the sad fact of the matter is, in Flashpoint #1, the first Flash-centric event, the most uninteresting bits throughout the issue were of Barry Allen. Literally EVERYTHING else going on around him, especially everything with Batman, was 10 times more fascinating. Well, I wasn’t going to say it, but…. My gripe is 12 issues of the main series, plus a 3 issue mini series, and we’ve still to see any characterisation given to ANY of the characters in the book!! The only thing we’ve been given about Barry is thanks to Johns’ retcon, he now has mummy issues. And don’t get me started on the ham fisted effort on the Reverse Flash. I’m shocked Johns hasn’t had him tie Iris to the railway tracks as he cackles and twirls a moustache. That said, credit where it’s due, Flashpoint #1 read like a bit of harmless fun. I won’t be buying any of the tie-in stuff, so hopefully DC keeps it’s promise and delivers a complete story without having to spend a king’s ransom. Not as Flash-centric as I was expecting either. To be fair, Eobard’s pretty much always been a spiteful cackling stalker. Johns is just making him more dangerous to boot…and overusing him. The latter part is the problem, I think. So far, my favorite issues of the new series has been the spotlight issues on Boomerang and, especially, Thawne. Dastardly Death was a good opening arc. Road to Flashpoint has been dull and boring. Delays have hampered the title but the story just wasn’t there regardless. The interaction between Barry and his Flash Family was never really fleshed out that much so the intervention scenes came across as weak and ineffectual. I still have little clue as to why Bart hates Barry so much. Barry pushing off Wally, someone who has known Bart for far longer than himself, in helping calm Bart down doesn’t look right either. Perhaps Flashpoint is what the title, and the character, needs in order to stabilize the Family more solidly.